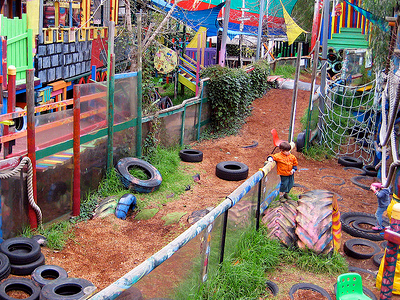 Where is Melbourne's Best Adventure Playground? Well, my kids have safely made it through their playground years (though there was the time I caught my daughter by the gumboot just before she face-planted in the mud as she fell over the side of a sudden-death massive slide in England.....). However, I have spent the better part of the last 14 or so years slogging my way through the various playgrounds on offer in Melbourne. And let's be honest, a lot of them - especially those built in the 80's and 90's - are VERY VERY bland - all in the interest of health and safety and reducing council insurance premiums of course. Thankfully, a bit more excitement is starting to creep back in now, with sky-high climbing nets and modern takes on the wonky roundabout in many playgrounds, but we were always on the look out for one of those old-fashioned playgrounds, where there was a bit of thrill, a bit of risk, hopefully even a bit of mud and a whole lot of fun to be had. Skinners Adventure Playground, between 209-211 Dorcas Street, South Melbourne - all the things you didn't know you could do with a shipping container! Call before visiting (03) 9209 6352 to confirm opening hours - mostly open after school and usually staffed (Melways 2K E2). Albert Park Fort, Aughtie Drive, Albert Park (opposite the Pits) - a rambling long wooden fort built by the local community, which is hide and seek heaven for the under-9's (Melways 2K F10). I know there are lots more fantastic adventure playgrounds across Melbourne. Take a few moments to share your nomination for best adventure playground in Melbourne with Weekend Notes readers via the Comments. Why would you recommend it and what is your kids' favourite play feature there? Why? Coz' kids just wanna have fun! We have taken our grandkids to Finn's reserve,Lower Templestowe where there is a great playground containing everything you could ask for, and it is all enclosed so the kids have freedom and are safe. Map 33 B4 in Melways. Thanks Ian - I think Melbourne Playgrounds is a great website with lots of very helpful reviews - thanks for the tip! The Tim Neville Arboretum in ferntree gully is our household favorite. They have a beautiful park for kids. 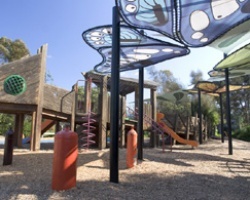 For people living in the Frankston area I recommend Ballam Park Reserve, [Cranbourne Road (West), Frankston] great playgrounds, BBQ facillities, plenty of space to play ball games and generally have a great family day out. Bollygum at Kinglake (behind the pub) is a sensory delight for kids of any age. Get out of the city, enjoy the fresh air and let the kids explore! Eltham North Adventure Playground (Wattletree Rd) is a massive fort style structure filled with adventure. Best suited to 3+ in most cases, it's a place crying out to be explored!